GST ki Percentage (%) ko Over Write kaise karte hai ? Example: Maan lo ki 1 Lakshya Communication Company hai, esme Smartphone Mobile ka Purchase / Sales ka kaam hota hai yah Company kush Product (GST %) Same rate se Purchase karte the (Example: Panasonic, Lava, Samsung etc.) OR yah Company New Product/Accessories ko alag (GST %) Rate se Purchase / Sales karte hai. Jo yeh GST % Same Rate or Alag Rate hota hai ese Over Write karna hota hai..
Gateway of Tally (F11)>Accounts Info.> Ledgers > Create > Click 1. Purchase 2. Sale 3. IGST 4. SGST 5. CGST En Pancho ko Vaise ki Ledgers Creation Create karna hai Jaisa ki Upar ki gayi pahli 1 to 5 Assignment. Gateway of Tally (F11)>Accounts Info.> Ledgers > Create > Click 1. Purchase 2. Sale 3. IGST 4. SGST 5. CGST En PanchokoVaisekiLedgers Creation CreatekarnahaiJaisakiUparkigayipahli1 to 5 Assignment. Gateway of Tally (F11)>Accounts Info.> Ledgers > Create > Click 1. Purchase 2. Sale 3. IGST 4. SGST 5. CGST En Pancho koVaise ki Ledgers Creation Create karna hai Jaisa ki Upar ki gayi pahli 1 to 5 Assignment. Ab ese fill karna hai. Gateway of Tally (F11)>Accounts Info.> Ledgers > Create > Click 1. IGST 2. SGST 3. 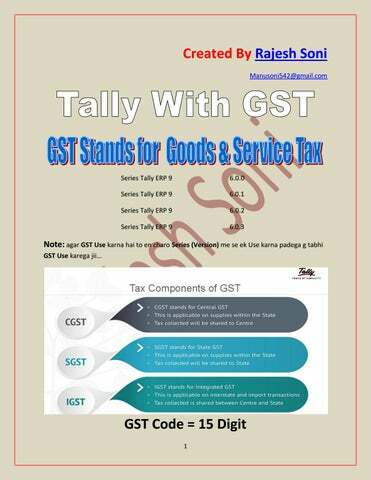 CGST En Teeno ko Vaise ki Ledgers Creation Create karna hai Jaisa ki Upar ki gayi pahli 1 to 5 Assignment. Gateway of Tally (F11)>Accounting Vouchers>Click Purchase Voucher (F9) (Jo Saaman Purchase kiya hai) 1. Ese Fill karna hai, jaisa ki niche dikhai gayi image me btaya gaya hai. Hello, it’s nice to meet you. My name is Rajesh Soni. I'm from India. I Live In Una ( Himachal Pradesh).